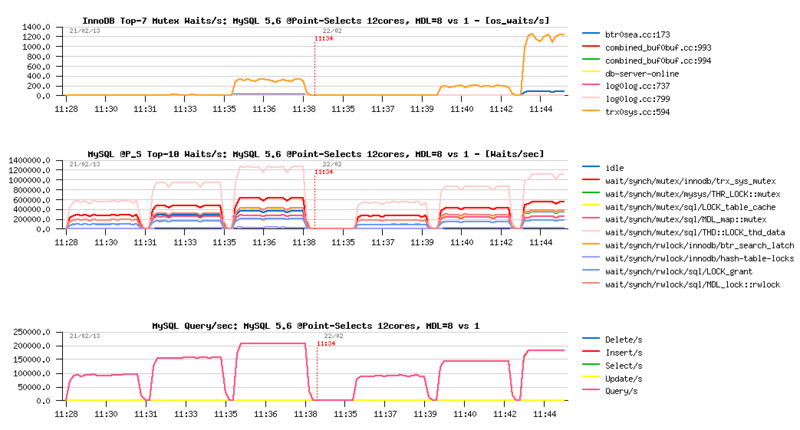 Following the previous post, this article is focused on performance problems reported by Mark Callaghan during MySQL 5.6 GA testings, which was initially about MDL contentions, and then also Performance Schema (PFS) overhead observed within the same OLTP Read-Only workload..
Let's split these 2 problems in 2 parts, and start with MDL related contentions first. "First of all I would like to emphasize that MDL was added to solve some problems with correctness of isolation between normal transactions and DDL, like infamous MySQL bug #989. It is not a replacement for the Table Definition Cache and its mutexes/locks are not a replacement for LOCK_open (though it has allowed to reduce the size of some of LOCK_open's critical sections). So it should be expected that this new synchronization mechanism introduces some extra overhead compared to 5.1. Especially in the case with just 1 connection since in this case the new synchronization layer just adds a pure overhead...."
And then continue with MySQL 5.5 documentation (while I think that this chapter should be extended with details given by Dmitry Lenev in the bug report) and there are several real-life examples pretty well explained in Ovais article. MDL is must to have feature in MySQL! but from performance point of view it represents a pure additional overhead..
any acces to a HASH requiring MDL_map mutex lock..
so, as long as your queries are taking time, or bringing many rows, or living inside of transactions with several queries -- you may even not remark any "contention" related MDL overhead (specially if you're hitting more hot locks like it was in MySQL 5.5)..
and what is fun: until you're having only one table "hot", contentions ratio between MDL_map mutex and MDL_lock rw-lock will be less or more equal (we're not keeping both on the same time, while every concurrent session will need to acquire a lock on the same MDL_lock for every query (as they are all accessing the same "hot" table))..
And it's exactly what Mark observed when reported initially in his bug report - using Sysbench OLTP RO Point-Selects scenario with 8 tables bombarded by many concurrent users.. So, what happened wrong since then, if Mark re-opened again the same bug in Feb.2013?.. - for out big surprise, according Mark's test results the bug was still here... While Mark used only 8 tables in his test and there was already 8 hash instances in MySQL 5.6 GA configured even by default.. Thanks to PFS (yes, Performance Schema again), we were able to understand the real source of the problem.. - and I'd say it was tragical and comical on the same time ;-)) -- for some unknown reason the famous my_hash_sort_bin() function gave very closer keys for different table names Mark used in his test... - As a result, always the same hash instance was used for all tables, likely there was only one single hash instance as it was before... Lack of luck? ;-) -- another hash function taken from InnoDB code worked just perfectly with Mark's table names.. (while my_hash_sort_bin() did not get any trouble to dispatch my table names ind different hash instances too ;-))... So, don't know how much InnoDB hash function will be better for a "final" solution, because hash key is hash key -- even completely different table names may still come with pretty close key numbers (and Dmitry is working on yet more improved solution).. But for a time being, if you're hitting MDL_map mutex contention, just think to increase the default metadata_locks_hash_instances=8 value to something more big (like 256 worked better for Mark). Now, how to know that you're hitting a non-equilibrated access to your hash instances? (if the difference between counter values is bigger, think to increase the metadata_locks_hash_instances setting, but be sure first that MDL_map mutex contention is present and remains significant, otherwise increasing a number of metadata_locks_hash_instances will not give you any visible improvement)..
Let's see now how big may be the impact of such a lock contention. and the difference in MDL mutex wait times reported by PFS (yes, again ;-)) is simply spectacular..
from the InnoDB lock waits report you may see that the number of waits/sec on trx_sys mutex decreased when metadata_locks_hash_instances setting was changed from 1 to 8, right?.. however, only PFS gives you the right answer on the graph before (with time waited per second) -- you can see that in both test cases the waited time on trx_sys mutex remained exactly the same! and looking on the graph above with PFS reported waits/sec you may see that trx_sys mutex is more often involved when metadata_locks_hash_instances=8 is used (which is as expected, as we're obtaining a higher QPS)..
BTW, from the same graph you may see that instrumentation code on locks is executed several millions times/sec, so, of course, impossible to have it with zero overhead..
despite high contention on MDL_map mutex with metadata_locks_hash_instances=1, it's still reaching 200K QPS at the end of the test..
and MySQL 5.5 is getting 205K QPS..
interesting that MySQL 5.6 with metadata_locks_hash_instances=8 results become already better than MySQL 5.5 since 16 concurrent user sessions..
And to finish with MDL, let's see how far we may go by lowering MDL locks even more... - to do this all we need is just to keep in mind that within a transaction MDL lock for the same table is acquired only once (and not for every query as in auto-commit)..
as you can see, instead of 230K QPS before we're getting 250K QPS now! Hope everything is clear so far with MDL locking, and let's get a look now on PFS overhead..
Before even start to discuss about, let me bring your attention to the article I've intentionally published last year about the Game of contentions - this show you by example that there is no "pre-defined" PFS overhead.. - as soon as you're hitting internal lock contentions within MySQL server code or InnoDB engine, you cannot say that PFS overhead will remain on some expected level.. - All depends which levels of instrumentation you've enabled, and which level of MySQL code you're touching..
Last year I've observed not more than 5% overhead on various test workloads when PFS was enabled by defaults (like it's today in MySLQ 5.6 GA). However, MySQL 5.6 performance was yet more improved since then, means PFS instrumentation code is executed yet more often too.. - so, when you're reaching a peak QPS level, and your performance is limited by internal MySQL contentions, then PFS overhead will be the most visible.. However, you may always go step by step, and enable PFS instrumentation according your needs. On the tested workload Mark reported 10% overhead between PFS=off and PFS=def (default) configs.. Let's see what I'm obtaining on my server on the same tests. However, let's go more in details of the PFS=def overhead. In fact, by default we're enabling tables+I/O related and statements related PFS instrumentations (all can be dynamically disabled/enabled at any moment), but what is the overhead of each one alone?.. However, I did not meet 10% PFS=def overhead reported by Mark.. - let's try replay the same test case on a different server. I'll try to reproduce the same issue by keeping MySQL server running within a 12cores taskset on 32cores server. PFS=off performance is 178K QPS..
PFS=off performance is 220K QPS.. So far, PFS overhead is slightly bigger on this server for some reasons.. (probably its higher sensibility to cache coherency playing a role here, don't know).. However, the PFS=none overhead is still 2%, while other instrumentations are still remaining available to be enabled dynamically on demand.. So, I still see more potential benefit to keep PFS=on (even as PFS=none), rather simply switch it off ;-) -- And again, all these overheads are known today and can be measured just because PFS instrumentation is dynamic and also configurable on compiler level (you may compile MySQL server without PFS code at all, or just without any mutex/rw-lock instrumentation, etc.) -- pretty different comparing to "static" solutions where stats collections are hard coded and we may just expect that their overhead is small enough.. (as well we're far today from initial 20% PFS overhead and other surprises).. This article is fully dedicated to the MySQL 5.6/5.5 vs MariaDB tests. So far, generally, when you're trying to understand a source of gap in performance results, you should try to start from the most simple case for both "solutions", "platforms", and so on.. For databases the most "simple" case is Read-Only (RO) workload, specially the OLTP RO workload which is fully cached by RDBMS buffers and no more depending on your storage performance, redo/undo design/options, and so on.. So, MariaDB is publishing the result of Sysbench-0.5 OLTP_RO test with 8 tables, running on a 16cores server and showing on MySQL 5.6 performance lower than 4500 TPS . And the most "closest" test I have in my list to match the same test conditions is OLTP_RO-trx 8-tables (also with 8 tables), but using Sysbench-0.4.13 version, and on my server on 16cores it showing more then 7500 TPS. Of course, I was surprised.. And even more surprised that MySQL 5.5 is performing better than MySQL 5.6..
so, we may expect some additional overhead here, and 5.6 may run slightly slower in workloads with a low level of contentions (such a single user session, or small/old servers (8cores and less)..
but such an overhead should not be bigger than 3%, and all our QA tests on 8cores servers confirmed it..
however, on bigger servers, with 16cores and more, you'll see the gap between MySQL 5.6 and MySQL 5.5 more an more bigger! our goal in MySQL 5.6 was to scale more far than 5.5.. - keeping in mind that 24cores (and bigger) servers become a today's commodity, it was really pity if you have a "big" server and unable to use it on its full power.. (and many users reported it)..
Well, let's come back to MariaDB test.. - we're not using the same HW, we're not using the same Sysbench versions, and so on.. And, discussions about these differences may be endless.. So, to understand exactly what is going on, I've decided to replay exactly the same OLTP RO scripts provided by MariaDB on my own server. if you're comparing MySQL 5.6 and MySQL 5.5 keep in mind Performance Schema (PFS) overhead..
in MySQL 5.5 this overhead is very big, and by default PFS in 5.5 is turned off..
in MySQL 5.6 PFS overhead is much lower, and that's why by default PFS is turned on in 5.6 with a minimal instrumentation enabled..
so, for a honest comparison PFS should be disabled on both engines..
yes, there is a small regression here in MySQL 5.6 results comparing to 5.5..
but regression is not out-passing 3%..
and, curiously, TPS is still better than under 4500 TPS level published by MariaDB..
Now : if you're really looking to get the Max performance from your 16cores server, you should not limit MySQL server to only 12cores (except if your goal is to see the max TPS on 12cores ;-)) -- the best performance will be usually seen when all 16cores are fully available to both: "server" and "client"! (as they're working in ping-pong: query/answer each one on its turn, and so on)..
and if you'll look attentively on my initial graphs with benchmark results, you'll see exactly the same (pretty similar performance on 8 and 16cores, then growing TPS gap since 16cores)..
What about 24cores now within the same test case?.. near 10,000 TPS and over 45% improvement comparing to 16cores result (6740 TPS Max)..
all these results are obtained on the same OLTP RO test case provided by MariaDB..
but using my own MySQL configuration settings..
Now, what will be changed if I'll use the my.conf file used by MariaDB in the testing?.. as soon as I've started to use "original" my.conf from MariaDB my performance was dropped to 4000 TPS only on 16cores..
which is matching perfectly the numbers reported by MariaDB..
so, for sure there is something wrong in the my.conf file.. but what?.. I've found that the problem is coming from the sort_buffer_size value !!! while MariaDB used 4M for both..
don't think it was intentional, but seems to me the main error was here..
once leaving it by default (256K) or setting to mine (32K), I've quickly reached the same near 7000 TPS level as I've observed before! The problem with "sort_buffer_size" is not new, and if you want to read more about, I'm inviting you to start from the "More on understanding sort_buffer_size" article by Ronald Bradford. This article also containing a lot of links to other posts (and I remember there was also an article testing impact of different sort_buffer_size values on OLTP workload, but I did not find it.. - but from a while I'm using 32K values for both "sort_buffer_size" and "join_buffer_size" on OLTP tests)..
don't forget to turn Performance Schema off in MySQL 5.6 if you're comparing it with previous MySQL versions (otherwise it'll not be apples-to-apples comparison)..
if you're looking for a full power TPS results on your HW server - share the same CPU cores for both "client" and "server" (or use another server for "client", but be sure your "client" activity (here sysbench) is not blocked by any HW or SW limits other than MySQL server itself).. So, the "mystery" with MariaDB benchmark results is finished for me now.. Focusing now on Peter's and Mark's problems..
Finalizing my series of MySQL 5.6 -vs- MySQL 5.5 benchmarks (best-to-best results and config settings (1), scalability (2), tuning details and yet more test results (3)), I've realized that it just needs a one point more - MariaDB results..
One of my friends called me to tell a story about an article in one of computer magazines saying that "If you're having performance issues with MySQL 5.5, you should try MariaDB 5.5 and you'll be surprised!".. It waked up my curiosity. MariaDB-10 seems to be only in alpha stage for the moment, and the latest stable MariaDB version in 5.5. So I've installed the latest for today MariaDB-5.5.29, and executed exactly the same Sysbench workloads on MariaDB too. I will not spend more time on it, but just sharing here my results. so, exactly the same conditions for everything..
just added MariaDB 5.5 into a game..
as you can see, MySQL 5.6 GA has the best performance, followed by MySQL 5.5, and MariaDB 5.5 comes in last..
and it's not only about performance.. - get a look on a full list of all new MySQL 5.6 features presented by RobY and PeterZ, as well a very good DBA & developer guide with many other details.. This post is the next part following the initial article about MySQL 5.6 vs 5.5 benchmark results (and MySQL 5.6 scalability). The focus in this article is on the "tuning impact" used during the published tests, and also I have for you few more test results to present which were missed initially -- Sysbench tests using 8 tables instead of a single one (as it does by default). Adaptive Index Hashing (AHI, innodb_adaptive_hash_index, default=1) is helping a lot and in many cases, but sometimes supporting very badly concurrent access or concurrent changes which is expressed by growing contention on the "btr_search_latch" rw-lock. Such a contention may happen not only on a mixed Read-Write (RW) activity, but on a Read-Only (RO) as well. And there is no general rule, and the only real test may give you a real answer (while "generally" you may expect a higher contention on a RW workload rather on a RO).. Spin Wait Delay (SD, innodb_spin_wait_delay, default=6) value is used on spin wait loops of mutexes and rw-locks in InnoDB. The setting is giving the "max" value for the random wait delay interval chosen on spin wait (expecting a mutex or rw-lock will be free soon, InnoDB is "spinning" (looping) on CPU involving "pause" instructions and trying to acquire the lock in the next loop). In fact this solution is "hiding" contention rather solving it, and may use CPU time a lot just for "spinning" (while we can do some other and more useful work) -- but in any case it gives you an expected benefit, and InnoDB locking is going really faster, and usually you're finally obtaining a better performance within your workload.. However, again, there is no "silver bullet", and the "right" value cannot be suggested generally, and that's why in MySQL 5.6 the default value remaining the same as in 5.5, while a bigger one can be more appropriate, but the result may still vary depending on your workload, CPU number, and CPU frequency on your server, and so on. At least the variable is dynamic and you can test it live on your workload (as I've made in RO testing, looking for the most optimal value).. I know that on my server this value may vary from 6 (default) to 128, and give a pretty interesting performance impact! For MySQL 5.6 tuning os this setting is simply a must, and you'll see how on one of the presented tests performance is dropping already on 64 concurrent user sessions (when default setting is used (sd=6)), while with a more appropriated one (sd=96) performance remains much more stable and much more higher!.. Best-to-best TPS/QPS performance : there are both, TPS and QPS graphs, so you're able to see a ratio between transactions and queries/sec -- personally I prefer to see queries/sec performance, as it speaks much better (reaching near 300K QPS with all SQL and MySQL layers overhead is telling more than 20K TPS, except if you're aware about what exactly your transactions are doing)..
as you can see, Spin Wait Delay is playing a very critical role for performance on your workload..
as well enabling or disabling AHI may bring some unexpected regression, select it right..
using or not using Hyper Threading (HT) for MySQL server is very depending on a workload too..
As promised, this is the first part of details about MySQL 5.6 vs 5.5 benchmark results I've published earlier last week. The following graphs are representing scalability results obtained for both MySQL versions on the published tests (and I have yet more test results to present to you, but these test's are still running).. I'm not using "CPU threads" terminology as I'm finding it confusing (for ex. when you're reading "16 CPU threads" you may not really know if there were 16cores with HT-disabled, or 8cores with HT-enabled)..
during all the tests I've disabled HT (as it took days and days more to test every case I'm interesting in)..
so for all tests when you're reading "N cores" it means exactly N physical CPU cores (HT disabled), except for 64cores = 32cores HT-enabled (which was just too long for graph legends)..
MySQL 5.5 was already scaling less or more well on small servers, up to 16cores..
MySLQ 5.6 is going way further now, and able to show you a pretty visible performance improvement when more cores are available on your server! 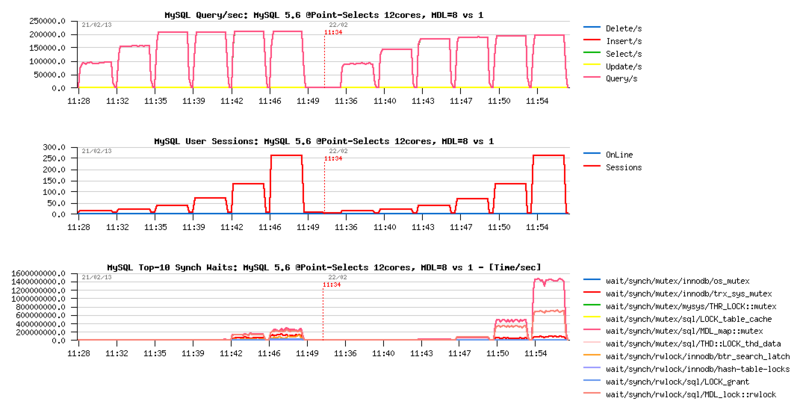 So, don't wait more, and start to use your servers with MySQL 5.6 on their full power right now! open your TODO right now..
As you already know, MySQL 5.6 GA is announced today and, there is no doubt, it the best ever MySQL release for today! If you've missed something about a long list of new features coming with MySQL 5.6, I'm inviting you to read excellent summaries written by Rob and Peter, as well many other detailed articles coming this week.. I'll present here the results I've obtained on Sysbench workloads (Read-Only and Read-Write) and will update this article with more details along the day (as some other tests are still running)..
the main key configuration options here which are making the difference are AHI (innodb_adaptive_hash_index) and Spin Delay (innodb_spin_wait_delay) -- while others are just good enough most of the time for the tested workloads..
about the impact of the AHI I've wrote a lot in the past (and you may find all articles here), and the main dilemma with AHI is "to use or not to use".. - in many cases it helps a lot to avoid block locking and speed-up index access, but on a high concurrency may become a show stopper due high contention on its "btr_search_latch" rw-lock..
while Spin Delay setting is requiring a very particular attention within MySQL 5.6, because it plays a critical role in managing of hot internal mutex and rw-locks contentions and may make you a difference in performance by 100% very easily ;-) (and you may find here all details about, while I may just add that there is no "silver bullet" e.g. no "universal" value which will be good enough for most cases -- all depends on your workload! - and that's why the default value (6) is the same as in MySQL 5.5, while it'll be up to you to find the most optimal for your workload; and as the setting is dynamic, you may try it live )..
Then, "point-selects" - this kind of reads was historically pretty good on MySQL, well improved on MySQL 5.5, but it's still a pleasure to see that even here MySQL 5.6 is showing a difference! The decreasing TPS level since 256 concurrent users is still wishing to get a higher level.. - but it's already x2 times better comparing to MySQL 5.5, and, after all, work is continuing, and then next MySQL version will be yet more better, you may just trust me ;-)) (for the time being you may get a more stable and higher performance level on bigger number of concurrent users by tuning innodb thread concurrency setting (see my previous article with results about))..
it's really the best ever MySQL version today! it's way faster than MySQL 5.5 on many workloads! it's way more "transparent" for performance analyzing! 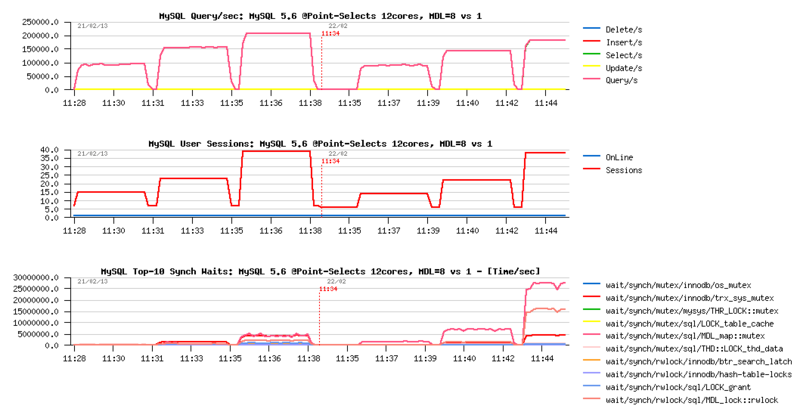 So, my the only question : What are you waiting to test your workload on MySQL 5.6 and prepare your database migration?..